may lead to table top dancing & bad singing! This colourful wine bottle label makes the perfect gift for a real party animal. 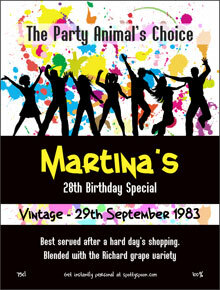 Ideal for 18th, 21st & 30th birthday parties, this bright idea will help you bring any party to life. 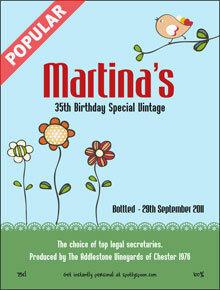 Holding a big birthday celebration in a hotel or club, why not label all the wine, beer or any other alcohol with a personalised label to make a splash! Note - good phrases that describe females and wine are 'have an excellent body', 'well rounded', 'with a delightful character', 'a rich bouquet' etc. 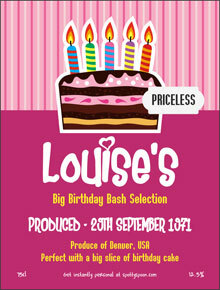 This is the second time I have ordered special birthday labels. Very pleased once again. Labels great and delivery quick. Really pleased with the labels.